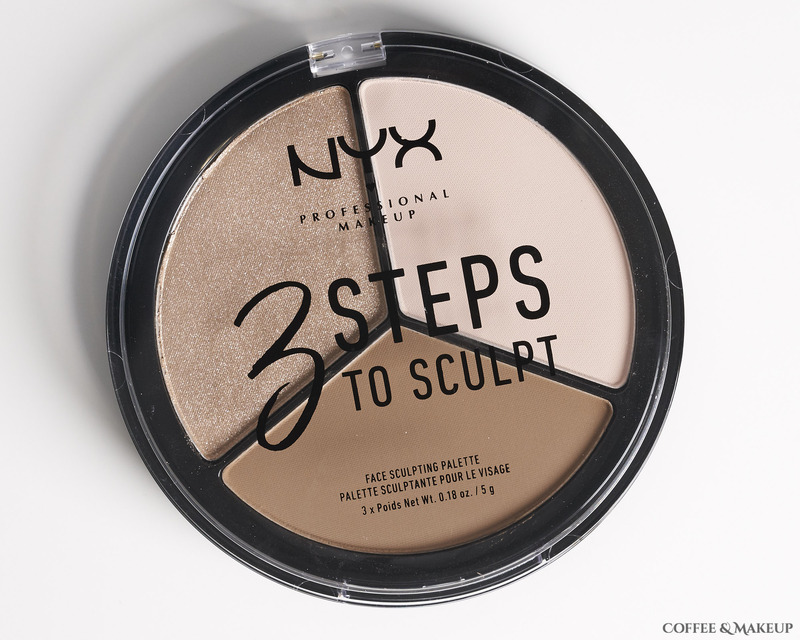 NYX 3 Steps to Sculpt ($12 for 15 grams) contains a contour, a matte highlighter, and an illuminator. The trio I am reviewing here is the shade Fair but there are four palettes to choose from for different skin tones. They can be purchased from NYX, Ulta, Target, Walmart, and Amazon. Highlight is pale cream with subtle pink undertones and a matte finish. I don’t use this as a matte highlight because I don’t like the way it looks on my skin but I do use it to buff out the edges of the contour or to mix in with the contour to lighten it up. I have tried using this all an all over face powder and to set the under eyes but I don’t think that it sits well on the skin used that way. It looks powdery and doesn’t meld into foundation the way a setting powder does. Nevertheless, I am glad that it is included as I think it’s very helpful to have to tone down the shade of the contour for a more natural look. Illuminate is definitely more of a sparkle/glitter and not really a shimmer or sheen finish. The sparkles are smaller than a typical glitter and they adhere decently so long as the skin is not overly powdered or dry. It can be applied lightly for a subtle sparkle or heavily for a nearly metallic shine. Because the sparkles spread out and you don’t get an even sheen like you would with more of a traditional highlighter, I don’t find that this emphasizes texture or pores on my skin. Contour is a medium brown with slight yellow undertones and a matte finish. In the photo, it’s pulling very red for some reason, but in real life it’s much more neutral. I purchased this online before it was available in stores and, based on the product photos, I thought the contour was going to be more of an ashy, cool toned contour shade which aren’t all that easy to find. It’s not. It’s definitely warm, but not overly so. It works as a contour or as a bronzer for me and I am happy with the undertone of it. It is pretty pigmented so I have to use a light hand and tap excess color off on the back of my hand before applying the color to my face. I also have to spend a bit more time blending it out. It’s not the worlds most even contour powder but I can get it to work. Here, I used an angled blush brush and tapped back and forth between the matte highlight and the contour shade. I patted the excess color off on the back of my hand before applying the color to the hollows of my cheeks, then blended generously. I applied the sparkly highlight with a big fluffy eyeshadow brush with somewhat of a heavy hand and buffed it out on the tops of my cheekbones.